In light of my upcoming trip to Croatia with JetSect.com, I decided to put together a list of the top reasons why YOU need to visit Croatia too. If, when you close your eyes and think about a Mediterranean vacation, you can imagine crystal clear, sapphire water and the walls of ancient towns looming over, then Croatia should be on the top of your European adventure list. Still not convinced? Then here are ten reasons why visiting Croatia is my priority and why it should be yours too. Croatia is part of the EU, but kept its own currency--the kuna. You’ll find Croatia to be one of the cheapest countries in Europe to travel too, as Croatian prices are very reasonable, especially when compared to the steep prices of neighboring countries. For instance, beer is usually only a couple of dollars and a fancy dinner for two, wine included, won’t set you back more than $50. If you’re like me, coffee isn’t just a drink, it’s about the experience of waking up in the morning and beginning my day. Most people know that both France and Italy pride themselves on being coffee connoisseurs, but it is much lesser known that Croatia gives those two a run for their money. Any meeting, gathering or friendly chat between friends or family members is usually held over a small cup of espresso and you can find cafes on almost every street corner. Coffee is ingrained into Croatian culture and so if you’re a coffee fiend like me, you’ll feel right at home. During the summer, you’ll enjoy daylight well past 9pm. This means that even if you only have a limited time to visit Croatia, you’ll be able to pack a lot more into your day. In fact, you’ll have time to spend the entire day on an adventure, come back to eat a lengthy dinner, and then spend a couple more daylight hours at the beach before watching one of Croatia’s unreal sunsets. Croatia is known to have some of the best sunsets in the world so be prepared to be wowed. Most fans know Game of Thrones was filmed in Iceland and Ireland, but one of its major film destination was also Croatia. The city of Dubrovnik is used as King’s Landing, and Trsteno Arboretum is used as the Red Keep’s gardens. The Fortress of Klis can be seen in the exterior shots of Meereen and the shots of St Dominic Monastery are used for the city of Qarth. If you’re a Game of Thrones fan, then prepare to be amazed at how much Croatia’s scenery strikes you as familiar. If you’re expecting white sandy beaches, then Croatia will surprise you. It’s crystal clear water is usually met by pebble stones. One of the most well-known beaches is Zlatni Rat, which graces a ton of postcards and travel brochures. However, don’t let that stop you from seeking out the lesser known hidden gems that dot the mainland. In general, Croatia seems to be a very happy country. Walking down the street, you’ll find many smiling faces and those willing to offer a “zdravo” (hello). Not only that, but Croatia is known to be tourist-friendly. Don’t be afraid to ask a local for a recommendation on their favorite place to eat or their secret swimming spot. Most will be more than willing to point you in the right direction and show you a less touristy side of the beautiful country. There is an island for everyone in Croatia, from vibrant party spots to desolate and pristine islets. Croatia has over a thousand islands that dot the turquoise and bright blue Adriatic Sea. If you like to party, then Hvar is known to have nightlife that beats Ibiza, but doesn’t take away from the amazingly preserved ancient city. On the other hand Vis is a foodie’s paradise, as well as has some amazing outdoor spots. Other islands include Mljet, which is half made up of a national park and Rab, which is one of the only islands that contain white sandy beaches. Many people visit Croatia simply to basque in its outdoor beauty and to see its diverse landscape for themselves. 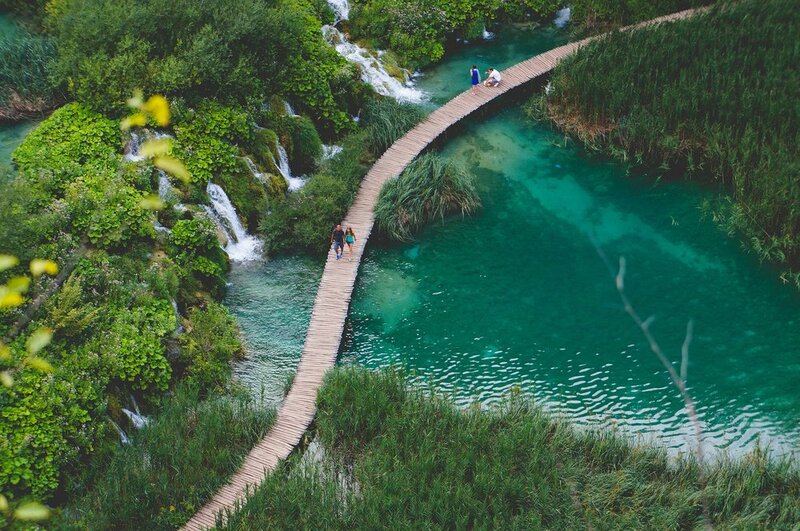 Croatia is much more than beaches and ancient towns, as it is filled with such natural wonders as the Plitvice Lakes National Park whose emerald lakes and countless waterfalls stuns its visitors. It is just one of the many natural attractions that lures millions of visitors every year, such as the Blue Cave, Krka National Park and the Paklenica karst River Canyon. Croatia’s history dates back many centuries and although it is long and twisty, most locals are more than happy to offer you a summary. You can spend hours walking the old city streets and gazing at the Venetian and Roman architecture. If you’re a history buff, then you’ll be in heaven exploring the many landmark buildings, memorials and museums that tell the intricate tale of Dalmatian kingdoms, republics and modern day independence. People come from all over just to experience Croatian-style wining and dining. While you’ll find the coastal areas to have an Italian influence and a penchant for high quality seafood, the inland is more known for their meat dishes and Central European flavors. Croatia is particularly famous for its exquisite homemade pastas, incredible lamb and mouthwatering risotto dishes. To pair with these, the wine that Dalmatia wineries have worked on perfecting for hundreds of years is sure to impress.